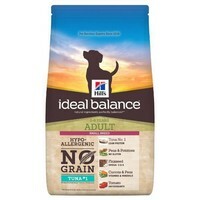 Hills Ideal Balance Small Breed Adult Dog Food (Tuna & Potato) provides natural ingredients perfectly balanced for small breed dogs aged 1-6 years old. Perfectly balanced to guarantee perfect nutrition, the food has a great taste your dog will love and contains no corn, wheat or soy. There are also no artificial colours, flavours or preservatives. Lean Protein – Helps keep your dog slim and trim. Vitamins & Minerals – To keep your dog playing longer with more energy. Vitamin C – To boost natural defences. Natural Fibre – Helps keep your dog’s digestion system healthy. Antioxidants - Promotes bladder health.